Some neighborhood vigilantes have been trying to slow traffic in whatever ways they can — like painting "slow down" in the street. Normally, the only people out on Elmwood Avenue early on a Saturday morning are dog walkers and joggers. But on this particular Saturday, a group of volunteers is taping off and spray painting a makeshift traffic circle in the middle of the intersection of 15th and Elmwood. One of them is Eric Hoke. 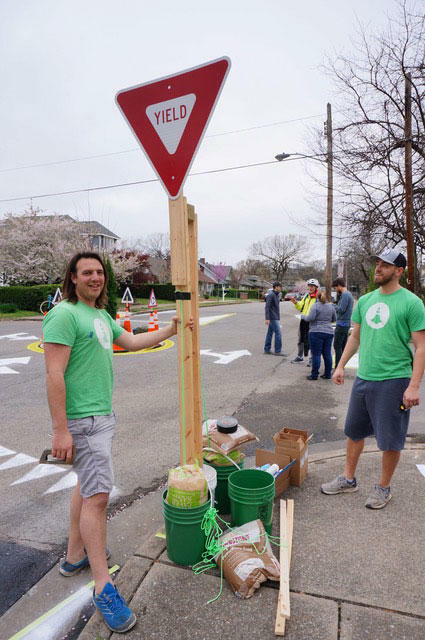 This morning he and other volunteers are working on Nashville’s first “pop-up” traffic calming circle. 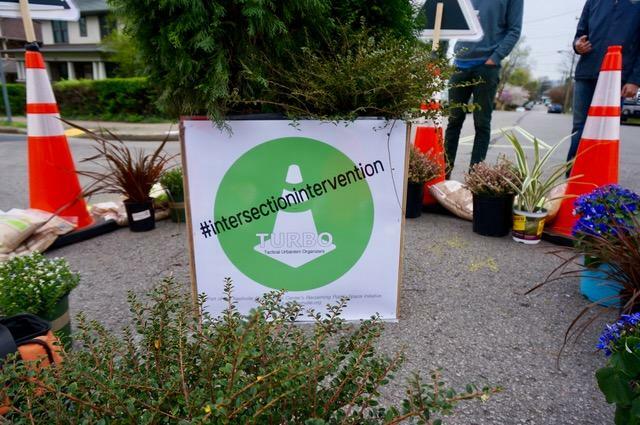 The idea is to force drivers to slow down by putting an obstacle in the intersection — in this case, a 10-foot wide circle full of trees and plants, surrounded by sandbags. Plants and sandbags that mimic a sidewalk mark the center of a temporary traffic circle. If it proves effective, Metro will likely install a permanent one. “If this were to be a long term or permanent project, there would be a curb in the middle of the traffic circle,” says Hoke. That's what the sandbags are meant to emulate. “That should be pretty close to what a curb would look like,” he says with satisfaction. What Hoke and his fellow volunteers are building is a very different kind of traffic project. Nothing is permanent. None of the materials were paid for by Metro government. A local landscaper donated the plants. The neighborhood association covered the cost of spray paint and traffic cones. There’s a police officer on hand, along with a city engineer. But Chip Knauf, who oversees traffic-related projects for the city’s department of public works, says this is very much the neighborhood’s project. Eric Hoke holds up a temporary "yield" sign to alert drivers. One of the leading exponents of tactical urbanism is Janette Sadik-Khan. For six years, Sadik-Khan ran New York City’s Transportation Department under then-mayor Michael Bloomberg. During her tenure, New York closed Times Square to traffic and created temporary parks and plazas across the city — often using nothing more than paint and planters. Now Sadik-Khan is working with Mayor Megan Barry to bring a similar sensibility to Nashville. “Traditionally transportation projects take years and years and years to get done,” says Sadik-Khan. Tactical urbanism starts with a different mindset, she says. Residents of Elmwood Avenue have actually been agitating for a traffic calming circle for years. Initially, Public Works didn’t seem interested. That changed after Mayor Barry took office. She happens to be a resident of the neighborhood. Metro’s Chip Knauf says he expects this will be the first of many “pop-up” projects. “Neighbors know what they want in their neighborhoods and they know what problems they have in their neighborhoods,” says Knauf. He says Public Works is ready to partner with neighborhoods in new ways. As the residents of Elmwood Avenue wake up, some come out to gawk. 9 year-old Ian Zwerner picks up a stencil and a can of chalk spray paint and starts filling in an arrow. But he’s skeptical that sandbags and spray paint will work. “Mom, aren’t the cars going to crash?” he asks in a worried tone. This morning, at least, motorists are following the arrows. According to Public Works, the cautious driving continued even after the volunteers were gone. While the traffic calming circle was in place, the number of speeding drivers fell by 75 percent. That success may mean more projects to come. Nashville is ready to pursue light rail train service. That was the big reveal in the “State of Metro” speech by Mayor Megan Barry. “I am very happy to announce that today the work begins to create light rail service on the Gallatin Pike corridor,” she said to applause near the end of her address outside Bridgestone Arena. Nashville traffic can push drivers to extremes. But what if the fastest way to reduce congestion was for drivers themselves to make small changes in how they behave?